Towns Incupe and Saulkrasti added on line Riga - Skulte (square C3). Strectch Incupe - Saulkrasti double tracked (C3). Freight only line to Baltiyskiy Les is connected on the line Kaliningrad - Baltiysk in Shipovka (A6). Lines Chernyakhovsk - Sovetsk and Chernyakhovsk - Zheleznodorozhnyi closed to passenger traffic (Squares B5-6). Line Mazeikiai (Lithuania) - Renge (Latvia) closed, removed from the map (Square B3). Freight only line Musta - Auvere closed. Tootsi area narrow gauge network partly closed. New freight only line south of Orava under construction to join the line toward Pechory-Pskovskiye. Line Tukums II - Ventspils reopened to passenger traffic. Town Sauriesi added (East of Riga). Freight only line Sauriesi - Ergli closed. Line Klaipeda - Silute reopened to passenger traffic. Freight only line Vaivara - Sillamae added. Town Pakruojis and Klovainiai added. Freight only lines Pakruojis - Petrasiunai and Pakruojis - Klovainiai added. North of Kaliningrad area corrected. Adding of places Johvi and Ahtme (North-East of the country). Freight only network in the area of Kohtla and Johvi completed. Adding of places Lagedi and Muuga (East of Tallinn). Freight only line Lagedi - Muuga added. Adding of places Tootsi and Lavassaare (North of Pärnu). Narrow gauge freight only network between Tootsi and Lavassaare added. Line Daugavpils - Robeznieki - Bigosovo (Belarus) closed to passenger traffic. Name Alyt corrected to Alytus. Name Rizgonis corrected to Rizgonys. Name Salcininkai corrected to Salcininkai. Name Naujoji-Vilnia corrected to Naujoji Vilnia. Place Bugeniai added (North-West of Mazeikiai). Freight only line Mazeikiai - Bugeniai added. Line Klaipeda - Pagegiai reopened to freight traffic. Place Rimkai and Draugyste added (South of Klaipeda). Freight only line Rimkai - Draugyste added. Town Rokiskis added (East of Panevezys). Section Rokiskis - Sapeliai closed to passenger traffic. Town Anikscai added (South-East of Panevezys). Section Anikscai - Rubikiai sees heritage trains. Town Bezdonys added (North-East of Vilnius). Section Bezdonys - Pabrade is single track. Name Zvirinas corrected to Senieji Trakai (West of Vilnius). Station Neman-Novyi added, town Krasnoye Selo removed. Freight only line Sovetsk - Krasnoye Selo shortened to Neman-Novyi. Station Svetlogorsk renamed Svetlogorsk II. Places Riabinovka and Khrabrovo added (North of Kaliningrad). 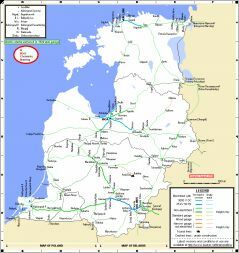 Freight only line (Kaliningrad) - Riabinovka - Khrabrovo added. Place Lesnoye removed (West of Kaliningrad), the line Kaliningrad - Baltiysk is double tracked only to the suburbs of Kaliningrad. Complete redrawing of the lines south of Kaliningrad toward Mamonovo and Poland and toward Bagrationovsk. Station name Zheleznodorozhnyy correted to Zheleznodorozhnyi. Broad gauge line Chernyakhovsk - Zheleznodorozhnyi opened to passenger traffic. Adding of station Pabrade (line Vilnius - Daugavpils). Naujoji-Vilnia - Pabrade double tracked. Kyviskes in place of Kiviskes. Kyviskes - Kena double tracked. Line Paneriai - Valciunai opened to passenger traffic. Adding of station Marcinkonys South-West of Varena. Varena - Marcinkonys opened to passenger traffic. Line Senove - Lihachi (Belarus) removed (closed). Short stretch of single track East of Kaunas on the line toward Vilnius. Line Garliava - Palemonas (Kaunas avoiding line) opened to passenger traffic. Line Kaliningrad - Bagrationovsk opened to passenger traffic. Line Chernyakhovsk - Sovetsk opened to passenger traffic.